The EUG Wireless Projector might not win awards with its image quality, but a wealth of functionality and an attractive price make it an interesting option for budget shoppers. The EUG Wireless Projector is one we have serious reservations about. Color accuracy, brightness, contrast, and resolution are not in line with modern budget TVs by any stretch, let alone some of the better projectors we have tested. If you were hoping to get the kind of picture quality you see in a modern HDTV set, but in a bigger format, you will likely be disappointed. That said, the connectivity options are so abundant and the price is so low, that there are a lot of fun and creative ways we can imagine using this projector to justify the purchase. Initially, we were under the impression that the EUG Wireless Projector was a small format projector before it arrived for testing. Perhaps it was the bizarre photoshopped marketing materials, or just wishful thinking. But alas, when the projector arrived and we took it out of its box, we realized the truth: the EUG Wireless Projector is big. Measuring 13.3 x 10.4 x 4.7 inches (HWD), this is definitely on the larger side of projectors we’ve tested recently, especially given its resolution and brightness. This probably won’t be a dealbreaker for too many people, but it’s something to keep in mind if portability is somewhere on your list of desired features. The EUG Wireless Projector starts to make up some ground when it comes to connectivity. The projector gives you two HDMI inputs, two USB inputs, one VGA input, a Composite video, and a Component video port. This is more input options than we are used to seeing on projectors, and could end up being a plus for those working with a lot of legacy devices (such as older game consoles). Those looking to fire up their N64 to play the original Super Smash Brothers with a group of friends will probably appreciate this feature. For that purpose, the 1280 x 800 native resolution won’t be as much of a drawback either. 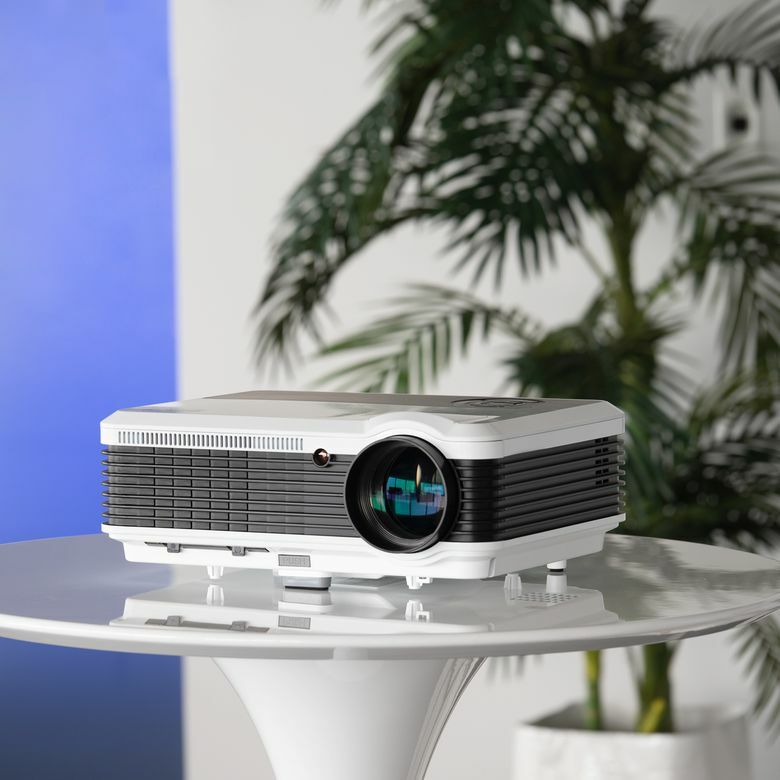 The connectivity options are so abundant and the price is so low, that there are a lot of fun and creative ways we can imagine using this projector to justify the purchase. On the top of the device, you’ll find a power button, a directional pad for navigating menus, an OK button, a source button, and a menu button. There are no big surprises with the functionality of this control pad, and we don’t imagine you will have any issues here. The projector comes with a quick release foot in the front to help angle the projector slightly. If you wish to adjust the keystone slightly, the projector supports up to 15 degrees of adjustment via a knob in the rear of the device near the power. Opening the box, you’ll find a power cable, HDMI cable, VGA cable, AV cable, remote control, user manual, and of course, the projector, with lens cap included. This is more cables than we typically see included with a projector. It’s a nice complement to the wealth of connectivity options on the rear of the device. When turned on, the EUG Wireless Projector starts to distinguish itself from its peers immediately as an Android logo appears on screen. After a short loading period is finished, you will see the custom Android UI, which more closely resembles a smart TV or console menu system than an average projector. We will cover the software in greater detail in the software section of this review, but this was certainly an interesting part of the setup process. When you begin using the projector, you can choose to bypass the software by simply selecting the appropriate source. You can opt to connect a standard HDMI source, but also have the benefit of using wired or wireless smartphone mirroring. Additionally, the USB ports on the back can be used to plug and play supported media directly to the projector. It supports most of the video formats one would expect (AVI, MP4, WMV, etc.) as well as MP3 or WMA audio, and JPEG, PNG, and BMP photos. As for the projector’s throw, you’re looking at a modest ratio of 1.3, which is definitely not in the realm of short throw, requiring 21.8 feet from the projector to the screen to reach the maximum advertised diagonal screen size of 200 inches. This is fine if you have the space for it and you plan for it, but it definitely makes it less desirable as a coffee table projector. It won’t beat out many name-brand solutions on pure image quality, but it finds a unique niche of connectivity options that make it a good choice for certain buyers. Focusing is performed by simply twisting the exterior of the lens to achieve the desired focus. Unfortunately, we had trouble getting the image completely in focus during our testing, no matter how carefully we tried. There were differences present in the focus from top to bottom on the projected image, which is somewhat frustrating to work around. One last thing we’ll make note of is the projector noise. When the projector was on, it was definitely audible in a quiet room with no other sound present. It was loud enough that you might not want it positioned close to your head when you are watching movies or playing games. The EUG Wireless Projector is definitely a budget projector, which means it has an image quality that corresponds with the price. The projector gives you moderate image quality with relatively low contrast and lower luminance levels. Its 1280 x 800 native resolution is below full HD (1920 x 1080), which in the world of TVs is standard fare at this point. You will have an incredibly difficult time even finding a TV that offers less than FHD (1080p) resolution today. What this means in practice is that when using the projector anywhere near the high end of the advertised maximum screen size, it will be very easy to detect individual pixels, and this “screen door effect” might be an area of concern for some users. Contrast is a somewhat similar story. EUG rates its contrast at 5000:1 in some places and 4500:1 in other places, for some reason. We imagine the truth is probably on the lower end of that range. Color performance was definitely below some of the other (admittedly more expensive) projectors tested in our roundups, but probably not enough to sound any alarms. Out of the box, our unit had a noticeable blue cast, which we were able to bring back in line somewhat after tweaking the settings. Overall, we would have hoped for slightly better color contrast and saturation, but we can definitely live with what EUG gives us for most daily uses. A 1280 x 800 native resolution is below full HD (1920 x 1080), which in the world of TVs is table stakes at this point. Luminance is another can of worms entirely. First of all, the rated brightness in the title of the product is “3900 lumen”, whereas elsewhere in the marketing materials “3600 lumens” is advertised. Second of all, brightness is a figure that projector manufacturers tend to play pretty fast and loose with, but most manufacturers have settled on the American National Standards Institute’s ANSI Lumens as an agreed upon measuring standard. Even ANSI Lumens are a contentious figure among projector experts for many reasons, but the EUG Wireless Projector does not even mention “ANSI Lumens” anywhere, and we have to assume this is because this isn’t how their figure was calculated. The projector was visibly darker in our tests than any of the other projectors tested, even those rated at 2200 lumens. The EUG Wireless Projector is still plenty bright in dark rooms, but don’t expect it to perform well in moderate or brightly lit rooms. Lastly, sharpness was a considerable issue when we were using the EUG Wireless Projector. Despite our best efforts, the image always appeared to be somewhat out of focus, and when placed in a low position suffered from an uneven focus from the top to the bottom of the image. This effect was mildly helped when the projector was mounted further away, but this came with the drawback of larger pixels and lower overall clarity due to the larger picture size. Onboard audio isn’t the shining star on the EUG Wireless Projector, and you should plan to connect the projector to a separate audio source where possible. This is generally our guidance with pretty much any projector, but it is particularly important with this projector in particular. You can easily connect a Bluetooth speaker or make use of one of the ports in the rear of the device to accomplish this. Strangely, however, the EUG Wireless Projector lacks a standard 3.5mm aux audio port. For all the shortcomings the EUG Wireless Projector has, rich software functionality is certainly not one of them. The projector runs on Android, and is capable of running a number of built-in or downloadable apps. YouTube works out of the box, along with an included browser, but most other apps will need to be downloaded. Additionally, the projector lets you cast content using Miracast, Airplay, or DLNA streaming. At $380, the EUG Wireless Projector is on the lower end of the price spectrum. Despite the discount, there are definitely a number of drawbacks to consider from the lower resolution to the large size and lackluster audio. If you want an inexpensive option for more casual multimedia scenarios, you might be perfectly satisfied with the EUG Wireless Projector, but if you want to play high-quality content, you may be better off saving up for a better option. Take a peek at some of the best high end projectors you can buy. The closest peer to the EUG Wireless Projector, at least in terms of price, is Optoma’s HD143X. Optoma’s projector is definitely a step up in cost at an MSRP of $499 but it’s an equally big step up in terms of image quality. The HD143X gives you a 23,000:1 contrast ratio and full 1080p resolution, both marked improvements. The Optoma also does a much better job with sharpness, providing a clearer image from corner to corner. The EUG Wireless Projector still has a significant advantage on connectivity options and legacy device support, however. If you plan on playing games with older game consoles, it is definitely a huge advantage to have native support for older video inputs. Similarly, if you’re mainly using your projector in a group setting where everyone wants to take turns showing content, EUG definitely has a better solution. A unique balance of features and performance. The EUG Wireless Projector ultimately presents an interesting balance of features and performance at a very attractive price point. It won’t beat out many name-brand solutions on pure image quality, but it finds a unique niche of connectivity options that make it a good choice for certain buyers. Product Dimensions 13.3 x 10.4 x 4.7 in.